Bobby McElver (actual instruments, engineer, world traveler). Bobby is the cultured side of Lanfair Field. He lives in New York and works too much. His webpage is here, but I don't think he up-dates it. 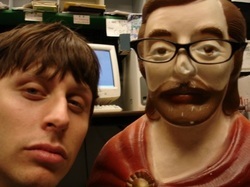 Here he is pictured with Jesus.